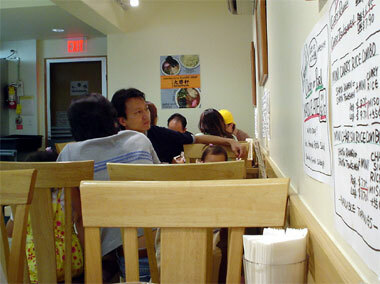 Lately, I've been noticing an influx of Japanese ramen shops opening up around town. I for one, love to eat ramen, and the weather, which has been rainy and quite dreary, makes it a perfect time to eat ramen. Since I live in town, and because I'm at the mall quite often, I've been driving past Taishoken for quite sometime now. 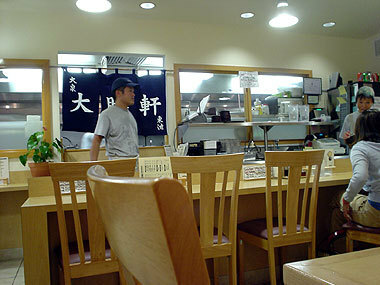 Taishoken, according to this post at World Ramen.net, is famous for its tsukemen (morisoba). I won't go into more details about the history of this dish, but from what I've read, it's supposed to be quite delicious. Walking through the door, you'll notice a room enclosed in glass on the left. This is where the ramen noodles and gyoza skins are made fresh daily. The dining area was not too crowded when I entered. Just a couple at the counter area and a few people scattered amongst 2 tables. Since the tsukemen is a specialty of this ramen shop, I decided to have the regular miso tsukemen with mini char siu rice combo (US$8.30). 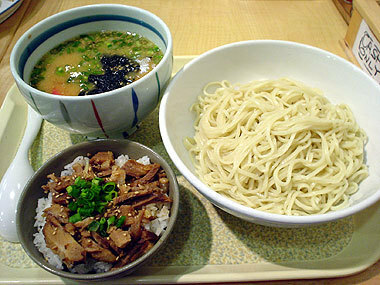 With this type of ramen the noodles are served separately from the broth. To eat, you'd dip the cold noodles into the hot broth. This made it a challenge to eat, but it was also quite fun. I'd never had to eat ramen this way before. The noodles were very fresh. Slightly chewy and a bit "springy", they tasted great with the miso flavored broth. Inside the bowl of broth, there were bits of pork, kamaboko (fish cake), nori (dried seaweed) and menma (pickled bamboo shoots). The broth was then garnished with lots of white sesame seeds and green onions. The broth, while flavorful, tasty and a bit spicy (from some chili that was floating around as well), was a bit too concentrated for me to sip on it's own. Much of it was left after the noodles were gone. The char siu rice was wonderful. The homemade char siu, or barbecued pork, was lean and tender. Unlike the char siu that is served at Chinese restaurants, this one was mildly flavored and tasted more of shoyu. This was also topped with a healthy sprinkling of white sesame seeds and green onions. Delicious! Since I was dining between the hours of 2:00 pm and 6:00 pm, I was also given 3 pieces of fresh, homemade gyoza at no addtional charge! What a surprise. 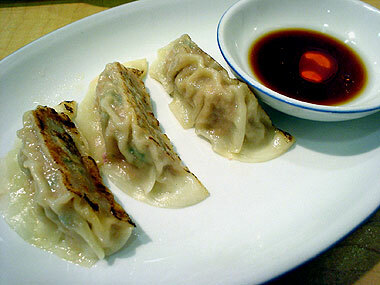 The gyoza was cooked in the traditional method and took a bit longer to arrive at the table. The skin was perfectly smooth and thin, the filling meaty and delicious. My only wish was that it was fried a little longer before being "steamed". I normally like it when the bottom of the gyoza is crisp and crunchy. Otherwise, this was much better than most. All in all, this was quite an interesting meal. The tsukemen was interesting enough, and tasty enough, for me to want to have this again. The regular sized portion was served with a lot of noodles which went perfectly with the flavorful broth. The mini char siu rice was great and the gyoza was a nice way to round out the meal. i'm very curious if u managed to finish up your meal in one go haha looked huge to me. It was yummy and something that I would be inclined to eat again. When I started doing some searching on the net for this place, I saw the pictures of the food, and yes, I too was drooling. 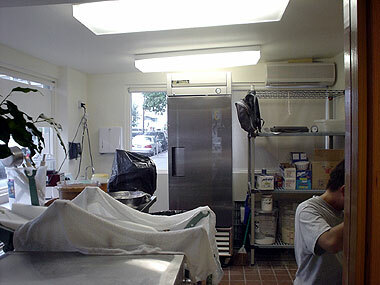 Once I got there and the dishes arrived, I was first impressed and the afraid. It was a lot of food...didn't know if I could finish it all. Nice to see you here again. Yes, it was a lot of food, and I ate slowly. I was just barely able to finish. I ended up having dinner at about 9:00 pm. Again! Darn those look good. Ramen outlets are also mushrooming over here. The "dip and eat" is kinda like eating buckwheat soba noodles. In Korea, they're known as "mo mil so ba". Funny thing was I was there on Sunday afternoon! 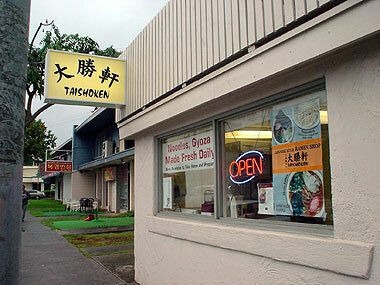 Anyway, if you love authentic ramen, I also suggest Yottekkoya in the McCully Shopping Center. The soup is wonderful (homemade, simmered for 10hrs!) and the charsiu will melt in your mouth because it is heated with the broth and not cut cold and placed on the ramen like taishoken. There are actually so many places here that I'm planning to do maybe a week long posting on the various ramen outlets. This was actually a bit different for me and it was actually quite good. The broth is quite concentrated and goes well with the fresh noodles. I'd be interested in seeing a post on what you have in Korea when you have a chance. Welcome to the blog! Maybe we were there at the same time. I heard about a new ramen shop at the McCully Shopping Center and was actually going to go there tonight, but never made it. Is it the one upstairs, the Kyoto-style ramen? Tenkaippin in Waikiki is great, you should try the hotteri ramen...mmmmm! First of all hello to everyone. I've been to several ramen places and unfortunetly I wasn't satisfied with Taishoken. The soup wasn't good at all. I actually had gone there more than once since my friends and family wanted to go on seperate occassions. Each time I went the soup was either very light or just plain horrible. Just giving my input. I'm sorry that you had a bad experience with the ramen at Taishoken. Thanks for sharing the information with us here. It's appreciated. I just went to Taishoken last night for the first time. I do not like ramen but I loved it here! I had the shoyu tsukemen w/gyoza. The miso tsukemen was also great (tasted my boyfriend's). 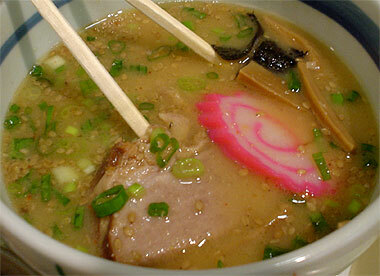 The only other ramen I have ever liked was in Osaka. I will definitely go back to Taishoken again! I went to Taishoken last Christmas, and I thought it was just fine. I'd say that Yottekkoya is the better of the two, but Taishoken's ramen is good too. Both had great service. Too bad there aren't more ramen places like these in LA. I'm glad you enjoyed the tsukemen at Taishoken, but what I really enjoy most are the fresh, handmade noodles. The miso tsukemen is one of my favorites. I have to disagree. I actually think that Taishoken is more than OK. The quality of the noodles is excellent, however, if you're not used to eating tsukemen, this style of ramen could really be off-putting. Many people don't like cold noodles served with hot broth. I just got back home to the bay area from my wedding and honeymoon in Hawaii. As a bunch of my mainland friends were flying out to help us celebrate, I referred a bunch of them to your blog to help them with restaurant choices. Just wanted to say thanks! I don't think we would have ever hit Taishoken and some other spots without your reviews (you were spot on about the tsukemen.) Thanks again! I'm glad you decided to celebrate here in our fair state. I'm also glad that you found my website useful in planning some of your meals out and I'm glad you found Taishoken. Hope you get to visit us again! Good luck! i will just put it to you this way: i asked my beau if we could try tai sho ken out this past sunday. we did, and i had the miso ramen. he had the pirikara, tsukemen style. we shared gyoza. from then on, i was hooked. i dragged the beau there the following night. i had the same thing--miso ramen and gyoza (this time, i got the combo version, which is a small ramen, a bit of rice, three gyoza and kim chee). the beau tried the curry ramen and got the char siu rice. we were both very content. fast forward to last night, which was friday night. i convinced a friend to go with me, and even though she is japanese, she doesn't favor japanese food much. but she loved the pirikara ramen and, for that matter, swore to look for the brand of tonkatsu sauce that they gave her for her chicken katsu. this time, i tried the shoyu ramen, which was good, but i learned i much preferred the miso. i had to promise my beau that i would not ask to go to tai sho ken again until 2007 to get him to go once more, tonight. by this time, he had decided that his favorite was the pirikara. i just stuck to my miso ramen/gyoza combo. what do i love? i think the noodles are of better quality than kyoto ramen (which itself is REALLY good ramen, i agree with you wholeheartedly). but despite the homogeneity of what i ordered this week, i really like the variety that tai sho ken's menu has over kyoto ramen. plus there's the choice of size of ramen--the combos come with a small bowl, but you can order a regular or a large, and let me tell you, i was amazed at the size of the large, which a skinny japanese national man ordered and ate with the robust enthusiasm i would have reserved for a famished sumo wrestler. and for some reason, i think the broth at tai sho ken is just a bit more complex and nuanced (or probably just a little richer) than the one at kyoto ramen. all in all, i have the happy occassion of blaming you again for giving me another food place to enjoy. my beau would probably be grateful to you, too, but since i've taishoken-ed him out, he'll be reluctant to say so until...oh, 2007.